Kaiten-Sushi Uogashi is a conveyor belt sushi restaurant right by Kyoto Station, inside the Aeon Mall. The restaurant is great especially for those who want a respite from the bustle of Kyoto Station. The restaurant is bright and spacious. They don’t only have counter seats but they also have table seating so the restaurant is also a nice place for families to have lunch or dinner. But the greatest lure of this restaurant has to be their fresh ingredients. They get their fish fresh from the fish market every day, so they use fresh, seasonal ingredients to make their sushi. 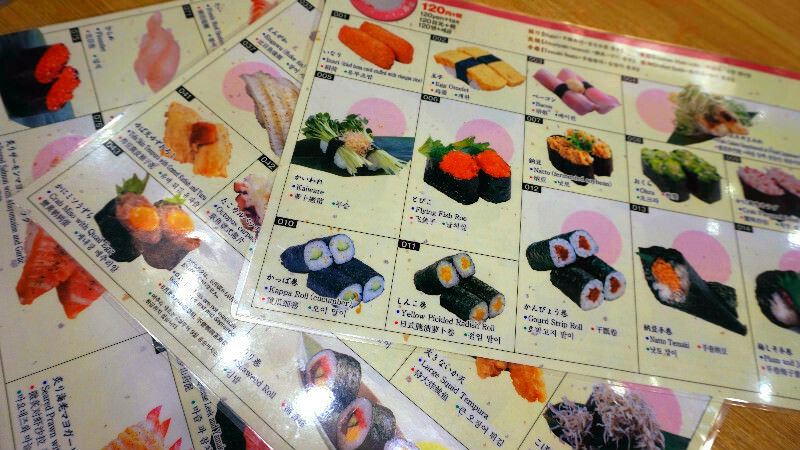 You can get delicious sushi for a reasonable price and the access to this restaurant is easy. You just have to go to this restaurant, but I want to especially recommend it to those looking for a place to eat close to Kyoto Station. The nigiri sushi at Uogashi is something you have to try first when you get to the restaurant. The freshness of the fish is the pride of the head sushi chef and is bought every day fresh from the fish market. Like in the picture, tuna is, of course, a favorite all through the year, but they also have seasonal fish that can’t be had elsewhere, so this restaurant cannot be left out of the sushi aficionado’s Kyoto itinerary. One other popular sushi at Uogashi are their gunkans. The most popular one among them is this, chopped tuna topped with green onion. The tuna on top of the gunkan is soft and juicy, and the gunkan captures the taste of red tuna well. The seaweed keeping the sushi together is fragrant, so you can enjoy everything in this gunkan sushi. This is for tuna lovers! This tuna trio has three types of tuna: extra-fatty, or otoro, fatty, or chutoro, and red meat, so this is an extremely luxurious plate of tuna. The fresh tuna bought that day from the fish market is so fatty it just melts in your mouth. For that this price feels quite low. The menu has pictures of all the dishes. They also have menus in English, Chinese, and Korean, so ordering is easy. This powder on the table is matcha tea, and if you put some of it in the cup you can drink hot matcha tea. After eating, stack the plates and call for the waiter. 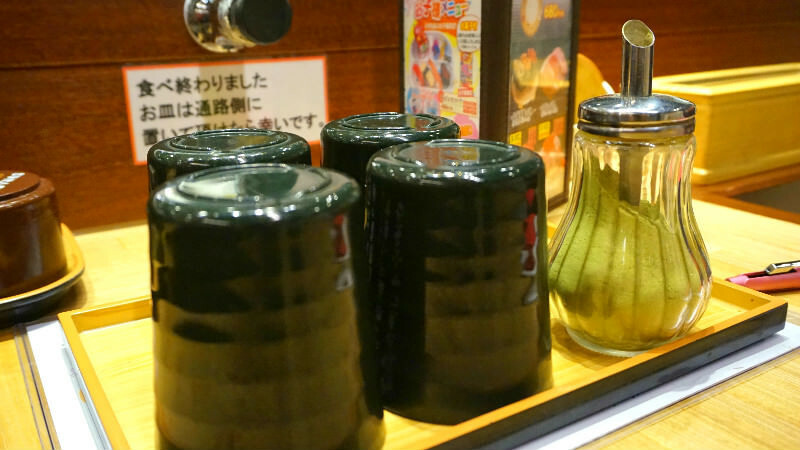 This conveyor belt sushi restaurant is located right by Kyoto Station in Aeon Mall, and inside the bright and spacious restaurant, you can see the sushi chefs making the sushi by hand. The fresh sashimi pieces are put on top of sushi rice making for delicious sushi, and their gunkan sushi with green onion and tuna with the crunchy, fragrant seaweed was so good I had quite many pieces. 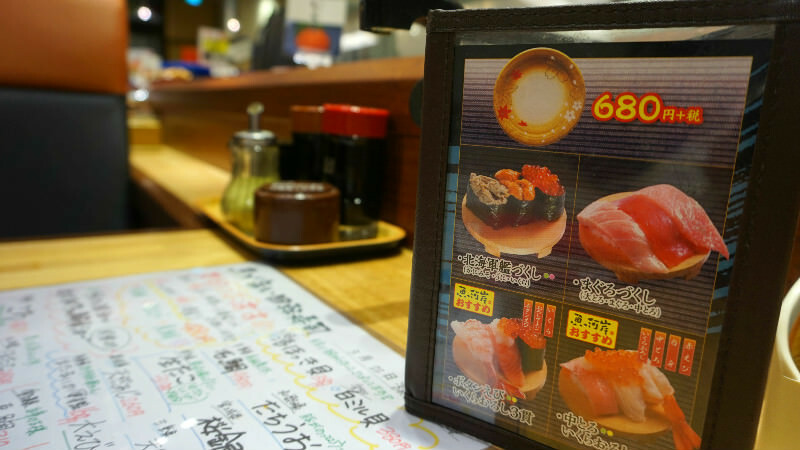 They also have menus in English, Chinese, and Korean, so you don’t need to worry about the language barrier, so how about some sushi after shopping at Aeon Mall? A 5-minute walk from Kyoto Station’s Hachijo-guchi Exit. The menu has pictures and they have it in English, Chinese, and Korean, and they sometimes have staff that can speak English, so this should be a sushi place you can visit without problems. They sometimes have staff that can speak English. 14 counter seats, table seating for 52 people.